Since there are plenty mistakes to be made when concealing breakouts, we reached out to a few experts for their best practices. Flawless skin, right this way. Flawless skin, right this way. Regardless of whether you’re having a great hair day or crushing it at work, one bad breakout can completely change everything. Not only are pimples incredibly inconvenient and totally unapologetic about it—as evidenced by the multitude of zits camping out on my right cheek—they can also be really hard to cover if you don’t understand the best practices to do so. Although pimples come in all shapes in sizes, there are certain makeup techniques that can help to minimize their appearance on your face if that's what you're looking for. 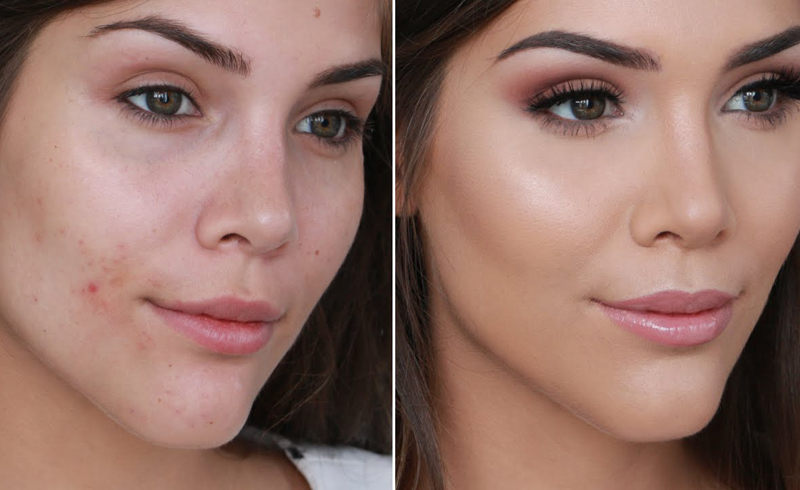 The right full-coverage foundation or finesse of a Beautyblender could be the difference between doing a little too much and a smoother, more natural-looking complexion. As someone who’s gone through lots of trial and error with zits and dark spots, I know that covering them up requires some skills—which is why I reached out for some expert tips. To find out how to make breakouts vanish (at least for a few hours), I spoke with Kelli J. Bartlett, artistic director at Glamsquad; celebrity makeup artist Allan Avendaño; and Dominique Lerma, Moda Brush executive artist, to get the lowdown on common mistakes we make when it comes to hiding pesky pimples. You’re not allowing your breakout to heal properly. Piling on a ton of makeup over your zits will not only make them more obvious, but also slow down their healing process. It’s not enough to just cover them up and hope they’ll disappear—treating the skin under the makeup will actually help pimples go away sooner. “One common mistake that women make when concealing breakouts is not taking the time to heal the breakout before moving forward with concealing it,” Lerma explains. “I never recommend putting makeup on an open breakout/freshly popped pimple. It’s as unsanitary as it sounds and the breakout will not heal properly when makeup is packed on top.” Editor tip: Since breakouts can become even worse if they’re improperly treated—resulting in dark spots or even scabbing—it's best to use a spot treatment like Mario Badescu Drying Lotion, $17, to help them dry out and heal before you conceal. You’re using dirty makeup tools. Not washing your brushes and sponges can cause them to collect bacteria, which tends to make acne worse. “Before even getting to makeup, you have to make sure that everything is clean, so no dirty brushes or sponges,” Avendaño tells SELF. Makeup guru Bobbi Brown has said that brushes that are used around the eyes should be cleaned at least twice a month while all others can be washed once a month. You’re not using a color corrector. You’re not choosing the right concealer color. Just like choosing the correct foundation shade to match your skin color, using the right concealer shade is important when covering up breakouts. “One of the biggest mistakes people make is choosing a concealer that is the wrong color for their breakout,” says Bartlett. “If the color is too light and the pimple has a raised texture, it will not blend into the surrounding skin evenly. Choose an exact match to your skin tone—or even slightly deeper—so that you can easily camouflage the pimple.” Think of it this way: Using a concealer shade that is too light for your skin tone is like putting a spotlight on your zits. You’re using the wrong type of makeup brush. To seamlessly cover breakouts, using the right application tool is key. Avendaño swears by a buffing brush (one with dense bristles) to apply foundation on his clients who are dealing with breakouts. “With foundation, I tend to use a dry buffing brush to apply the product in a circular motion,” he explains. He says he doesn't use blending sponges because he believes they actually pull product off blemishes—the opposite of what you want. Lerma agrees, explaining that brushes offer a more full range of motion for flawless makeup application. However, not all makeup artists are in agreement about sponges. 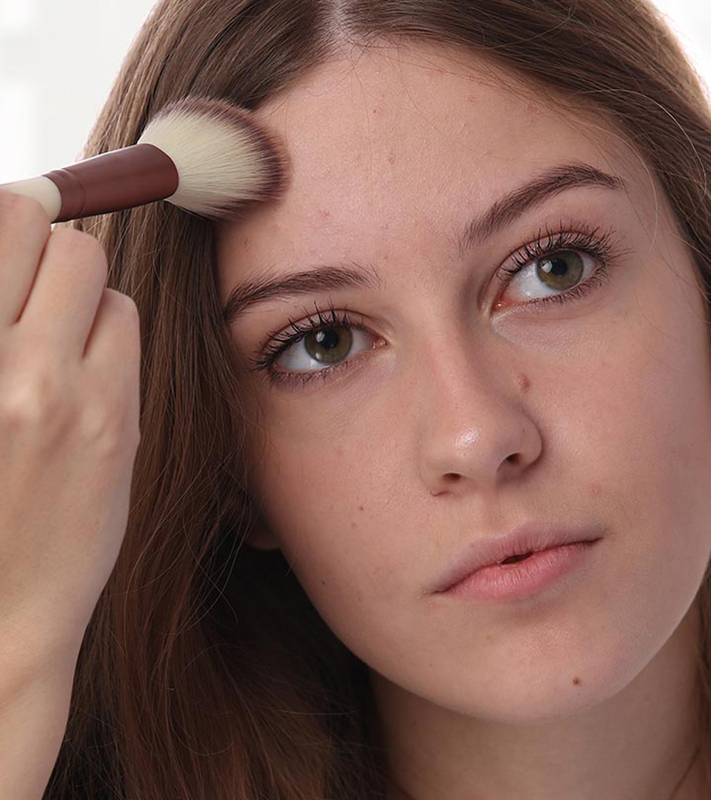 While Bartlett prefers to use a makeup brush on her clients with more acne-prone skin, she also uses a sponge to finish the look, which she called “a combination approach.” A small, firm brush can provide targeted concealing, she explains, adding that a fluffy brush will help to blend edges. “A sponge helps to melt makeup into the skin and make it look like it’s not [even] there,” she says. If you’re covering up an especially bad breakout, Bartlett advises using a dry sponge for more full coverage, as wetting a sponge tends to sheer out foundation. You’re applying too much makeup. One of the beauty lessons I learned the hard way was that overcompensating with more product to cover pimples will often make the situation look even worse. The top culprit? Too much powder, which “can give the pimple more texture, making it more visible,” Avendaño says. First, make sure any dry areas of the face are properly moisturized. If you choose to use a color corrector, apply that next, and then apply your foundation. Then lightly dab on concealer with a flat brush to the areas that need special attention. Build the product up in thin layers until the breakout is barely visible. Finish your look by lightly dusting the face with setting powder to help everything stay put.